The art of sweetgrass basket weaving is practiced in Gullah-Geechee communities along the southeastern coast of the United States. It is a tradition brought to these shores from West Africa during the Transatlantic Slave Trade. 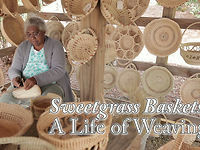 The art of sweetgrass basket weaving is practiced in coastal and barrier island communities from North Carolina to Florida, a region known as the Gullah-Geechee Cultural Heritage Corridor. The Gullah-Geechees are the descendants of enslaved West Africans who worked on coastal plantations. Because of their isolation, they were able to hold on to many traditions brought to these shores during the Transatlantic Slave Trade. Visit Charleston or Beaufort, South Carolina, and you'll see people sitting on rural roadsides or in city parks and on street corners selling these beautiful baskets. In Georgia, you'll find basket weavers on Sapelo Island and on St. Simons Island, and in coastal communities like Riceboro, Darien and Harris Neck. Each basket starts with a knot, and moistened grasses or pine needles are repeatedly coiled and wrapped with strips of palm frond stems. Some have lids, while others have handles and other ornate designs. Today they are considered works of art. However, the Gullah-Geechee ancestors used baskets for more practical purposes -- for storing food, toting things like crops from the fields, and for fanning rice, flipping the grains into the air so that the husk could be carried away with the wind. A short film about Alfreda Jamison, a sweetgrass basket weaver in Charleston, S.C. Ms. Jamison has been weaving baskets since she was 10 years old. This film is by Charles and Linda Gupton. Watch it now.